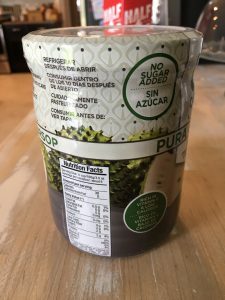 I’ve become very interested in soursop, and so I have been looking for a reliable source of good fruit. So I turned to Amazon, because I’m a Prime member, so I can get product for free on a two-day shipping here in the U.S. 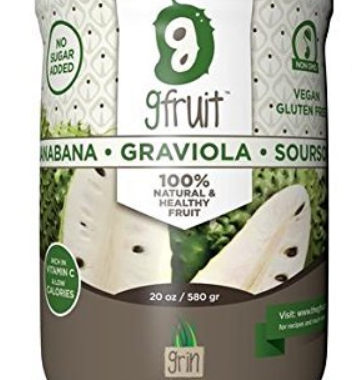 When you search the site the product GFruit comes up immediately. And so I bought it. It arrived two days later, neatly packed in bubble wrap. 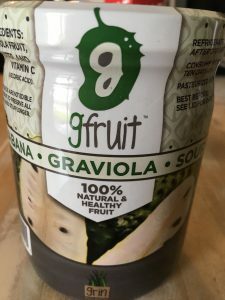 The GFruit branding is great. A curvy jar with a seal on the top. When you open it, it makes that nice pop sound as the vacuum is released. This is NOT a Juice, it is 100% Healthy Fruit. It is vacuum sealed for freshness. It is as if you were eating the fruit fresh from a tree as nature intended it. The seeds cannot be consumed. Refrigerate after opening, consume within 10 days of opening. NO SUGAR ADDED! Delivered the way nature intended. 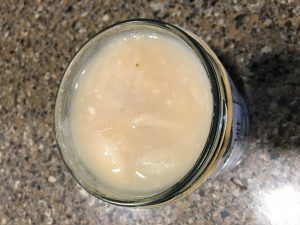 The fruit itself in the first jar I purchased was sour, which is not the way I expected it to taste. Ripe fresh soursop is sweet, and tastes like strawberry-banana or, some say, pineapple-mango. I suspect that the fruit in my jar was still unripe when it was vacuum sealed. The second jar I bought was much better. If you look at the reviews on Amazon, they are mixed. Some people say the fruit in their jar was delicious, other say it was overripe or sour. 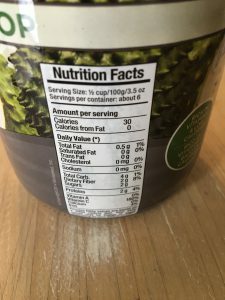 This suggests that the company that produces this product is having trouble gauging ripeness and is either packing underripe fruit or overripe fruit, sometimes getting it right. Overall, I’d give the product a 4 out of 5 stars for inconsistency. Picked, ripened to soft, then opened is better. But this produce is decent, if inconsistent. And it is an affordable way to get the glorious soursop on demand into your deserving tummy. But the best way to eat it is fresh soursop from a farm. Nearly as good as the fresh fruit off the tree that I remember. 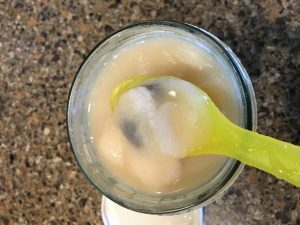 Here's how to a good dessert: After removing the seeds, grind the soursop up with a Magic Bullet or Ninja food processor. Then add sugar to taste. Delicious! Great product, I am reliving my youth.. I grew up eating this fruit daily, and it has not changed. People have written that this fruit is delicious, but the fruit I received tastes truly vile. I don't know if it is spoiled or if this is the way it should taste. If so, it is definitely not delicious! Posted in Reviews and tagged products.